We are always dreaming of the Florida Keys! At the southern most tip of Florida (just past Miami) lies a hidden gem for family travelers. This hidden gem is called the Florida Keys. Most travelers completely miss the chain of islands that make up the Florida Keys. In all of our travels, the Florida Keys is still one of our favorite places to visit. It truly is a hidden gem. We wanted to share some pics from the Florida Keys to inspire you to visit with your family. The Florida Keys are made up of several islands. One of the best ways to enjoy the Florida Keys is by boat or exploring, off the beaten path. This first picture was a sand bar right off Marathon Key. 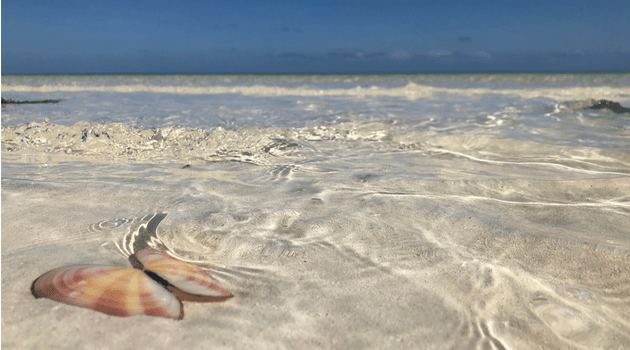 The popular Florida Keys YouTubers called Livin’ the Keys Life shared this amazing sand bar with us on their. Both Kelly and Hunter had so much fun exploring and making sand castles! This next picture was truly a “let’s go exploring” shot. 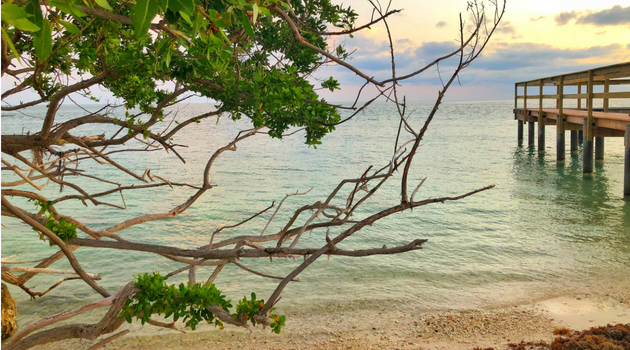 Along the highway into the Florida Keys, you can often just park on the side of the road to go fishing, snorkeling, or swimming. I saw this fun little area and decided we should hop out and go exploring. It was quite the adventure. We explored tide pools, wandered underneath these bridges, found some wild iguanas, and even stepped on a black snake (by accident). I think Tim jumped out of his skin once he realized it was a snake! LOL! 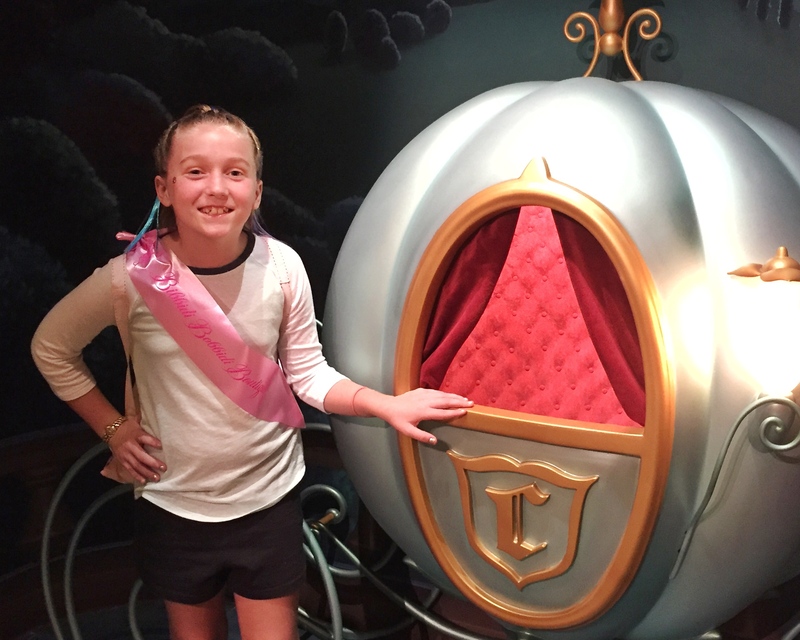 Sometimes random adventures are the most fun for the family. 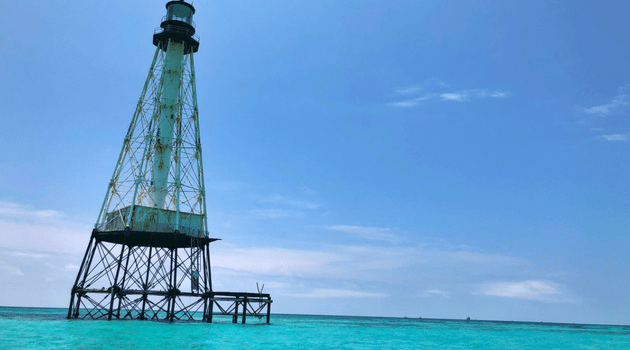 Our favorite adventure in the Florida Keys is renting a boat at Robbie’s and heading out to Cheeca Rocks and Alligator Reef. These are two reefs right off of Islamorada. We do get a lot of questions about Alligator Reef. They do not have alligators in this area, but there was a ship called the USS Alligator. This ship sank after attacked by pirates. That is why this lighthouse is called Alligator Reef. The water in these two reefs is just spectacular. It truly looks this color blue! Sunsets are just breathtaking in the Florida Keys. Many visitors head to Mallory Square in Key West to watch sunsets. Mallory Square is a fun experience, but it is not our favorite place to see a sunset. This evening we headed out to a park in Marathon called Sunset Park. Hmmm, do you think they would have a great sunset? Oh yes, they did! By far, my favorite place to see a sunset is on a boat in the Florida Keys. If you are not comfortable renting a boat, take an excursion. 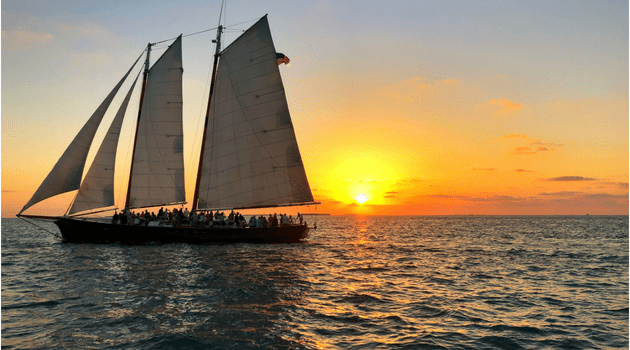 Fury in Key West hosted us for an excursion called the Double Dip Snorkeling & Sunset Sail. It included two snorkeling stops and the most spectacular sunset at sea. We even enjoyed this brief moment where a sailboat sailed right in front of us. We could not have asked for a more picture perfect moment! Since the Florida Keys is a chain of islands, the only way to get from island to island is by bridge. 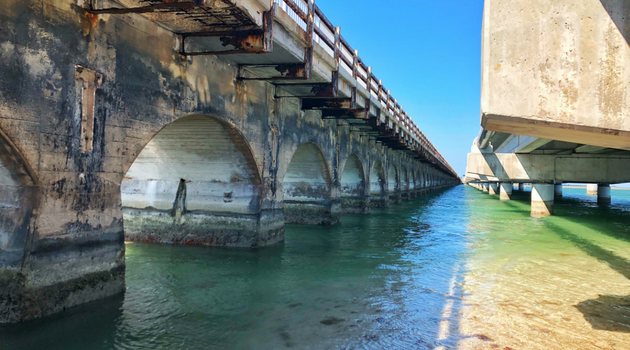 Some of these bridges are so amazing, including the popular 7 Mile Bridge. This bridge is a little over 6 1/2 miles, but they round it up to 7 miles for the name. LOL! 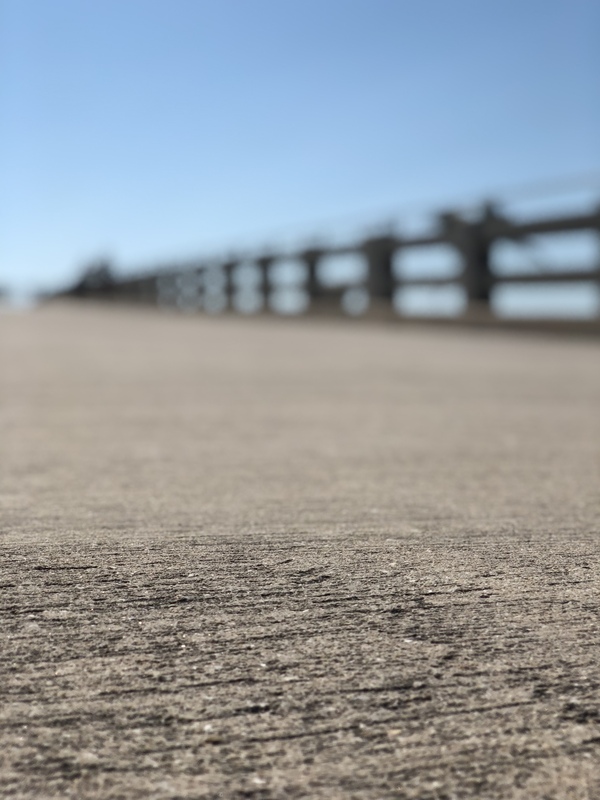 There are several older bridges that you can explore by foot. One of our favorites is in Bahia Honda State Park. You can explore the old Flagler Railroad bridge. This picture is from this popular bridge. We hope these pictures inspire you to bring the family down to the Florida Keys. You will have a vacation of a lifetime! You can click here to enjoy some videos from the Florida Keys. Be sure you pin this pic to your Pinterest for the future inspiration. Exploring Coral Reefs in the Florida Keys!